Right now, in Florida, huge, ripe tomatoes just about everywhere. I'm obsessed. Fortunately, I've had a few of these ripe tomatoes hanging around in my house, so I finally had the opportunity to make these sandwiches. 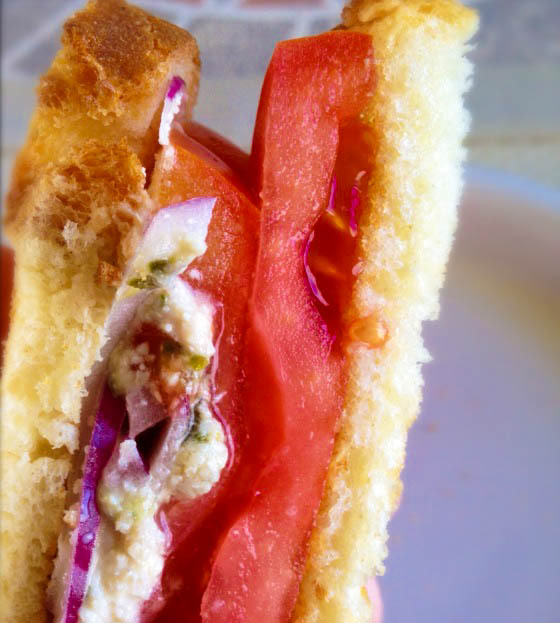 A thickly-cut, ripe tomato between two pieces of freshly toasted bread gets me every time. Such a sandwich takes me on journeys back to picnics in the woods on warm sunny days, to sandy beaches and cold pina coladas, and to Rome, where you can find a Caprese sandwich at every food vendor. These sandwiches remind me most of Caprese sandwiches, but because they are toasted, they are also reminscent of club sandwiches and BLT's. Add a little vegan "bacon" if you're feeling like having a vegan BLT. If you don't have (or just don't have time to make) cashew cheese, you can always replace it with Daiya mozzarella or Dijon mustard. 1. First, prepare your pesto. Add the basil, pine nuts, olive oil, and salt to your food processor and process until smooth. 2. Next, toast your slices of bread. You can cut the veggies while the bread is toasting if you want. 3. 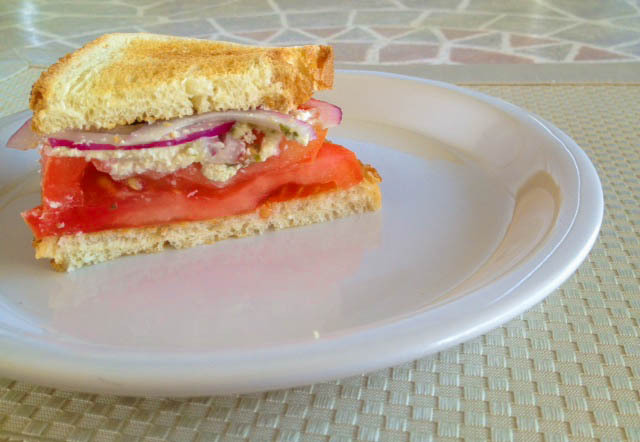 Once the bread is toasted, put 2 slices of tomato on each sandwich, followed by 1 tablespoon of cashew cheese, about 2 teaspoons of pesto, and about 1/2 tablespoon of the red onion. Top each sandwich with a piece of bread, cut each sandwich in half, and serve. Did you know that Florida produces 80% of the U.S. tomatoes from December through May-A fun fact. Love this sandwich. Healthy and delicious. Thanks for sharing. Ooh, I would love to sink my teeth into this sandwich right now. YUM! !